Contemporary Style Plastic Registers available in several finishes; antique brass, oak, polished brass, satin nickel, and white. ABS High Density Plastic Sidewall Register / Plastic Ceiling Register. A great product for bathrooms, or where a metal register may corrode or rust quickly. Victorian Style Satin Nickel Plastic Registers will not rust or corrode, making this a great option for kitchen or bathroom. 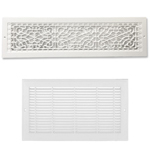 These plastic grilles are your perfect solution for high moisture areas. These are rust proof vents, ideal for locations like your bathroom or kitchen. They are intended for wall and ceiling use only. Available in many sizes to fit your needs. Classic Grills has expanded into resin grills to offer more variety and a different material. 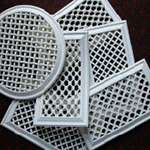 These resin grills are a great solution because they are resistant to rust, sweat, warping, insects, and more. Find many sizes and styles in a plastic baseboard cover. 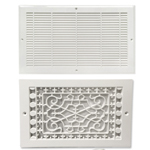 We offer the traditional slotted design baseboard vent covers and a decorative baseboard option. All made of rust-proof plastic construction and have a faceplate depth of almost an inch.